A quick view of the most influential metrics in Sabre Springs. The communities or neighborhoods of Carmel Mountain Ranch and Sabre Springs are located in the northeastern part of the city of San Diego, located in San Diego county, California. Carmel Mountain Ranch is also known simply as Carmel Mountain or CMR for short, it spans 2.337 square miles and is home to approximately 12,000 residents. Sabre Springs spans 2.483 square miles and is home to approximately 2,500 residents. Though their population geographic sizes are similar, the population of Carmel Mountain Ranch is approximately 3,988 people per square mile which far outsizes that of Sabre Springs, which has a population density of only 1,025 people per square mile. and the local boyscout troop, pack 624, serves both communities and is located Carmel Mountain Ranch. Sabre Springs was built as a master-planned community and features a number of walking paths, open green spaces and several golf courses. View our selection of available properties in the Sabre Springs area. 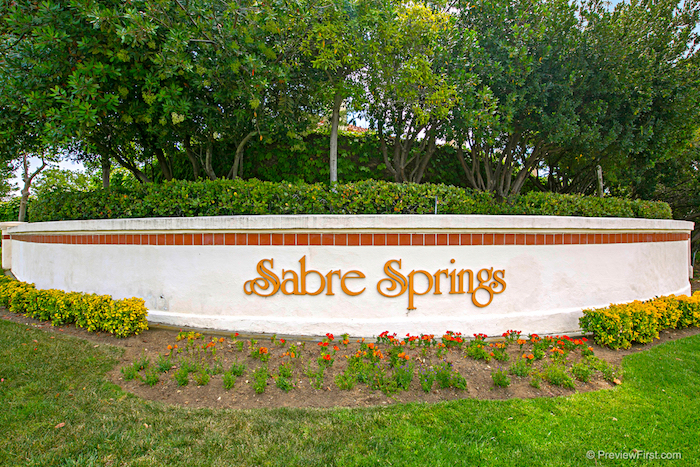 Check out the latest demographic information available for Sabre Springs. Learn more about schools near Sabre Springs complete with ratings and contact information. Browse through the top rated businesses in the most popular categories Sabre Springs has to offer.